The new Airpods or Airpods 2 will deliver faster connectivity pairing times. The new Airpods are slated to deliver more talk time and even come with hands free Siri connectivity. The new Airpods was launched by Apple along with the new iPad Air, iPad mini and a new iMac. Apple launched these new hardware ahead of its video streaming launch. The new Apple streaming service is expected to be launched on March 25. The new airpods can be ordered from the Apple website or Apple Store app. You can also buy the Airpods 2 from the physical Apple Stores, in the coming week. The new Airpods look almost like the original Apple Airpods and are cable free. It will come in black and white. The new Airpods feature wireless charging and Bluetooth 5.0. They come with the newly designed H1 chip to ensure efficient performance, faster connectivity pairing times and efficient battery life. With this you get 50 percent more talk time. You can switch between your devices while listening to music on iPhone, iPad or Apple Watch with the connect times becoming two times faster. The new Airpods provide hands free Siri connectivity. You can use the voice assistant to make calls, change songs and much more from the Airpods 2, without actually taking out your iPhone. The new Airpods come with a charging case. Apple is also coming out with a new Wireless Charging case for the earbuds. Both the charging cases offers more than 24 hours of listening time, to ensure that your Airpods 2 are charged and ready to go. To power the case, you can use the Qi-compatible charging mats without any need of cables. The new Wireless Charging case will also be compatible with the new Airpods. The LED light located on the front of the case indicates the charge status. The Airpods2 were expected to be different from its predecessors with regard to the Bluetooth SIG website. This does not seem to be so according to the official press release. In July, Apple filed a patent for biometric sensors regarding fitness capabilities. Another patent filed by them was for a technology to handle noise as well as dissipate pressure from within the ear canal. There does not seem to be any suggestion from Apple with regard to the new Airpods being a health and fitness device. 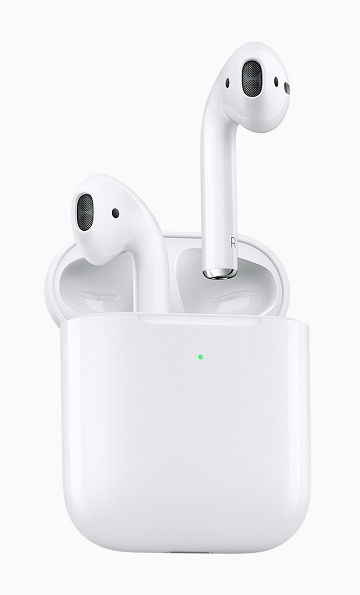 Another feature that does not seem to be present in the new Airpods is that it is waterproof and offers active noise cancellation. The Apple Airpods 2 along with the standard charging case is priced at $159. If you go in for the wireless charging case, then it comes at a cost of $199. The wireless charging case alone is priced at $79. Either of the cases can be engraved free of cost when checking out on the web or Apple Store app.